I have been working with Cisco firewalls since 2000 where we had the legacy PIX models before the introduction of the ASA 5500 and the newest ASA 5500-X series. The biggest changes in command syntax happened of course at the transition between PIX and ASA models and also after the changes in ASA version 8.3 and later (especially on NAT configuration commands). From ASA versions 8.3 and later (including 9.x) the command syntax does change a little bit on some commands at every new version update but the majority of core configurations remain the same. There are hundreds of commands and configuration features of the Cisco ASA firewall. The official Cisco command reference guide for ASA firewalls is more than 1000 pages. Therefore it’s not possible to cover the whole commands’ range in a single post. 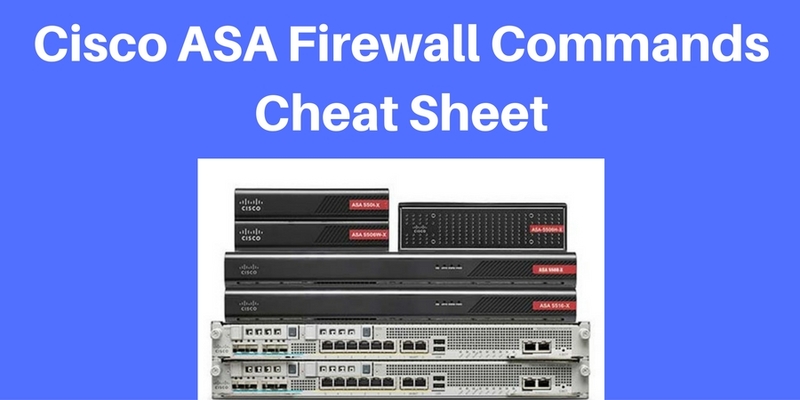 For this reason I have selected the most important commands and the ones used most frequently by ASA administrators to set up the firewall appliance. no shutdown : By default all interfaces are shut down, so enable them. I do not do social media. What I have done is purchased all of your e-books, and the new versions as they came available. It’s a shame that those of us who support the site through purchases can’t get the same pdf that the social media folks can get. I am a fan of your books, and keep hoping you’ll do a lab book project one of these days, I think you would do a terrific job. Sorry about that. Please check your email. Thank you so much for the file. After reading my comments again, they sound a bit condescending, please know that, that wasn’t my intent at all. I am a huge fan, which is why I buy your books, and value the resource that you provide everyone. You obviously put a lot of time and effort into this blog and share it willingly. I was pointing out that there may be other dinosaurs that don’t do social media, who support your efforts, that may want an opportunity to get the pdfs. So, apologies if my comments were a rub, I assure you, that was the farthest thing from my mind. I didn’t take your comments as “condescending” but as friendly feedback. No problem at all. About the lab manual, having a family with 2 kids seems to take up a lot of my time but I’ll try (maybe not exactly a lab manual but something similar). Just purchase your Cisco ASA Firewall Foundation ad got your bonus book also. Thanks very much. looking forward reading. Just studying for my CCNA Routing and Switching. Good luck to your studies and thanks for purchasing my book. Really your work is awesome ,I want to know that I had purchased your books (VPN+ASA) via amazon but I didn’t got any lab manual is it possible to get that. If you are referring to the complete configuration examples, these are included in the Amazon books (last chapter). Unfortunatelly it seems not working with my facebook AC, could you please send it via mail to me. many thx in advance? Any PIX firewall info ? I realize that they are older, but it is what I have. Unfortunately no info for PIX. I’ve worked with them in the past but don’t have any info now. Really great effort and it is very clear to understand of each command with info.